Wethersfield, Conn. (November 27, 2013) – Mrs. S. Claus will make a special guest appearance at the lively Holiday-Preview Party at the Webb-Deane-Stevens Museum on December 13, 2013, from 5 to 8 p.m. 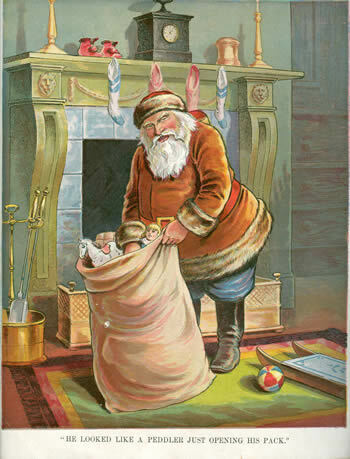 The museum invited Mrs. Claus, one the season’s most endearing figures, to read aloud the beloved classic, “The Night before Christmas or a Visit of St. Nicholas” while attending the party, and she has graciously accepted. Her appearance will open a special exhibit at the Webb-Deane-Stevens Museum: “The Night before Christmas: Celebrating the Origin of Santa,” which features enlarged color illustrations from the museum’s rare 1888 copy of “An Account of a Visit of St Nicholas.” Mrs. Claus noted, regretfully, that her husband is quite busy and unable to accompany her to the party. Guests at the party will enjoy a special candlelight preview of the dazzling holiday decorations throughout the museum. As they stroll from house to house they enjoy delicious food, wine, and live music—ranging from a brass-horn trio to holiday jazz standards—and chat with Mr. and Mrs. Silas Deane, Mrs. Claus, and other characters in period dress. Admission for the event is $25.Space is limited; reservations are strongly advised and can be made by calling 860-529-0612 ext. 12. Also, from December 14, 2013 through January 4, 2014, Three Centuries of Christmas tours at the Webb-Deane Stevens Museum demonstrate in fascinating detail how the American holiday season has evolved over the past 300 years. Designed to delight the senses and captivate the imagination, the one-hour guided tours include the museum’s three meticulously restored historic houses. For more information and hours visit our web site: http://www.webb-deane-stevens.org.